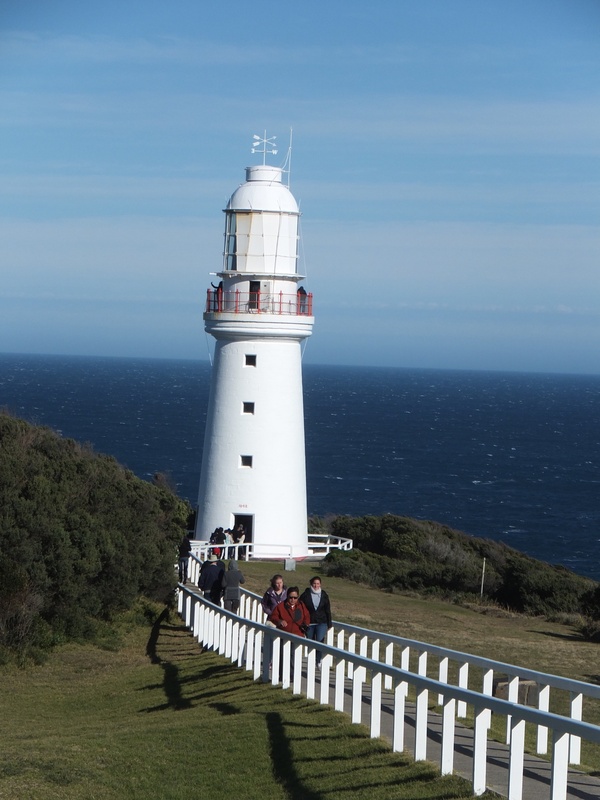 We took the opportunity to visit the Cape Otway Lighthouse on a recent trip to Apollo Bay. 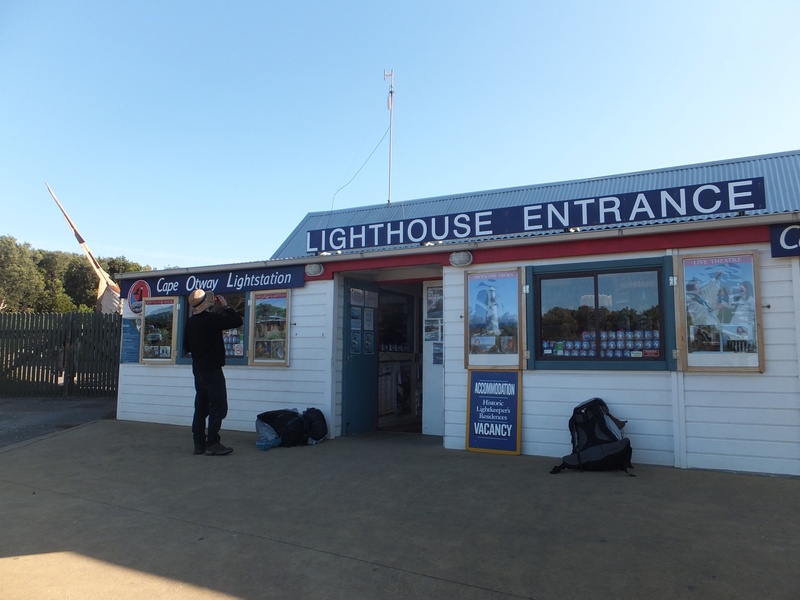 The lighthouse is a short drive off the Great Ocean Rd through the Cape Otway National Park. You can read about our experience spotting cute cuddly koalas. 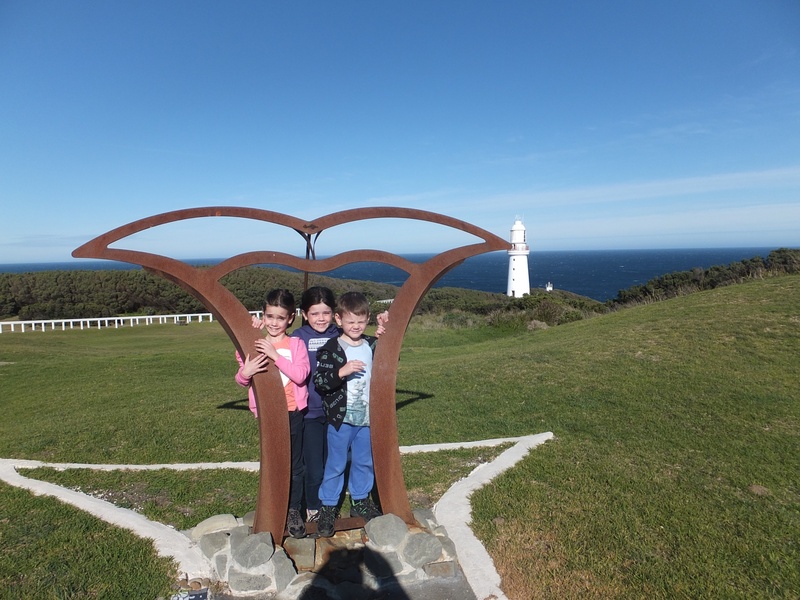 We stayed at Apollo Bay for the June long weekend and explored the area with the kids. You can read about our visit to the Otway Fly and our visit to the 12 Apostles. We were very lucky with the weather as its the first weekend of winter in Australia, the opening weekend of the ski season and we had sunny blue skies for our coastal visit. Don’t get me wrong, it was fresh and we were suitably rugged up but it was lovely to have some sun. You are able to view koalas here in the wild but you are unlikely to be able to get very close to them, there are other places in Australia were you would be able to cuddle a koala. Once you turn off the Great Ocean Rd, if you don’t stop to look at koalas, the drive down to the Cape only takes 15 mins, take it slow though as people do tend to stop for some koala gazing in the most inappropriate places, so take the curves slow! There is plenty of parking at the lighthouse and the entrance to the grounds is only a few metres from the parking lot. There are also public toilets at the entry which is handy. The entrance houses a souvenir shop and refreshments so you can bribe the kids, if their behaviour is good they might get an ice cream on the way out! Works a treat. The Cape Otway Lighthouse entrance. I felt the family ticket for 2 adults and up to 4 children is pretty good value by Australian standards. Family tickets normally consist of 2 adults and 2 children and then other children are paid for at the children rate. So I was pretty happy with his cost. 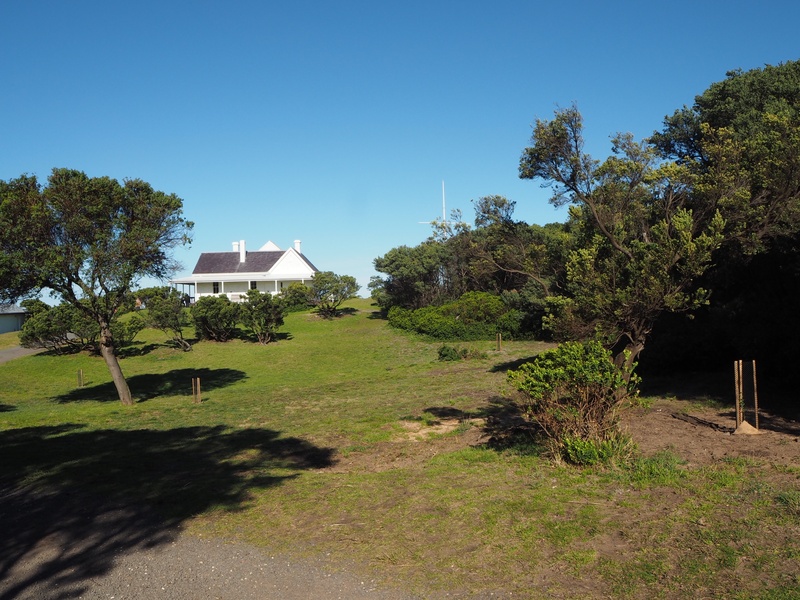 The grounds of the lighthouse include the Telegraph Station, the Lighthouse, the old lighthouse keeper’s quarters, now used as tourist accommodation and a cafe. There are also plenty of walking paths and look outs to take in the breathtaking views of the rugged coastline. I also learnt that if you are standing looking at the lighthouse, to the left is Bass Strait and to the right is the Southern Ocean. If you’re lucky between May and October, you might even spot a whale. If you follow the path straight from the entrance towards the Lighthouse, the first white house you come to is the Telegraph Station. The Telegraph Station was built in 1859 and housed the operators and their families. This telegraph station allowed communication between the Cape and Tasmania for the first time via morse code messaging. Telegraph Station – Beautiful stone house sitting up on the top of the hill. Its a beautiful old white stone home that has been restored over the years and it now open to the public to have a look around. There is a replica telegraph machine relaying messages like they would have back in the day. There was an old typewriter in one of the rooms and my brother in law asked Caelan, our youngest at 6 years old what it was. Clean looked at it, took it in for a minute then replied ‘Unc, that’s a BBQ!’. Very matter of factly as if it were a stupid question! There was an employee in the Telegraph Station providing information about the running of the house and what life would have been like back in the day. The Lighthouse was erected in 1848 and is made completely of hand cut stone with no mortar to hold it together. 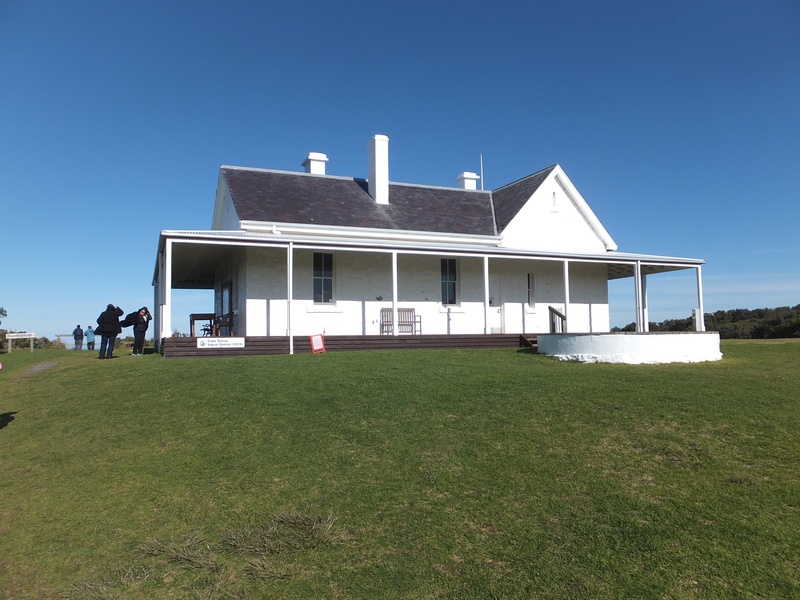 Today it is the oldest surviving lighthouse on the Australian mainland. You are still able to climb the stairs and walk out around the top to take in the views. This was the first time I have actually been inside and up the top of a lighthouse. The kids enjoyed the climb and especially the ladder up to the top and out on to the balcony. The day we were there it was outrageously windy so we were unable to spend much time taking in the awesome views at the top. It was also pretty busy so people were waiting for us to come down so they could go up. Make sure you are careful on the way down as it was a lot easier going up! 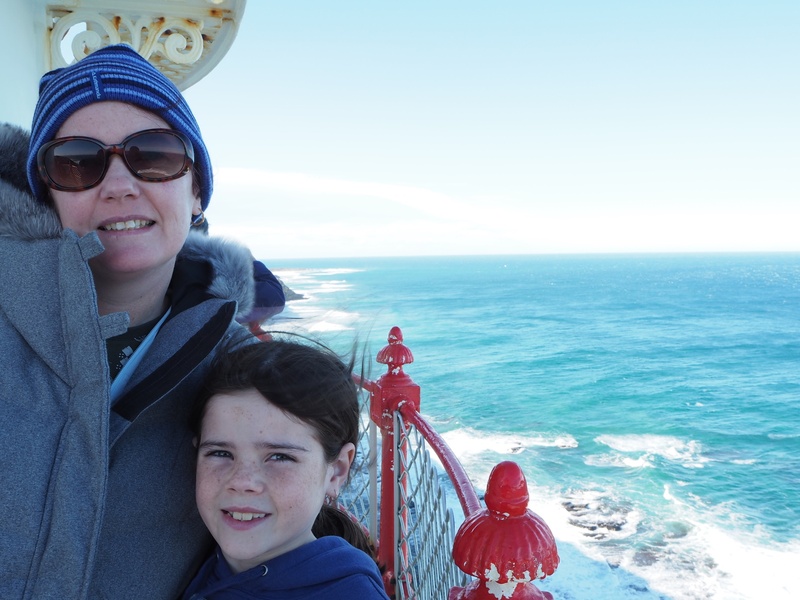 Alannah and I at the top of the Cape Otway Lighthouse. 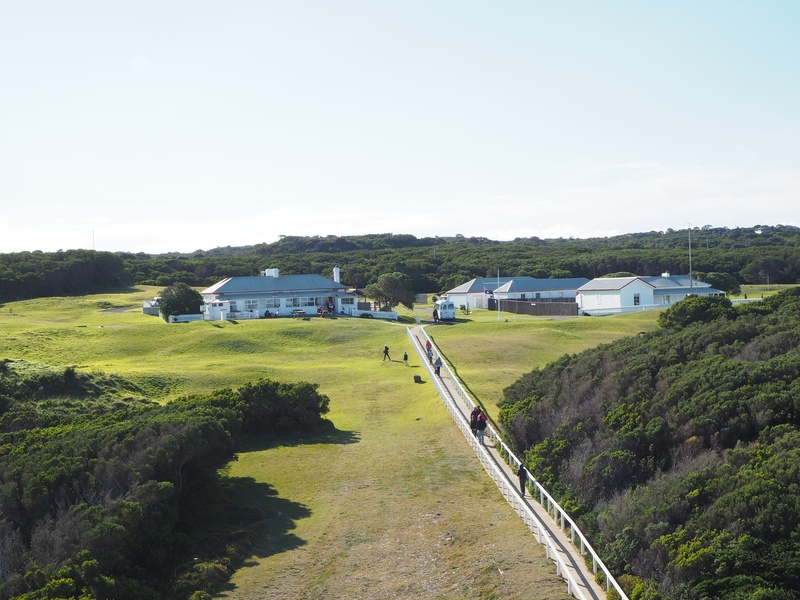 There are various options for accommodation at Cape Otway, in both the Head LightKeepers House & the Lighthouse Managers House, from B&B stays to self catered. The costs vary starting at $177.50 per night up to $450 per night. It would be a great experience and very romantic out there by yourself and exceptionally quiet, I’m sure you wouldn’t have any problem sleeping in out there! The sunsets would be amazing and I’m sure you would be a good chance of spotting some famous Aussie animals after all the tourists go home for the night. The cottages have verandahs there you can sit and take in the beautiful views or better still take in the sunrise with a hot cup of coffee. Hell yeah, you could easily spend the whole day there. Pack a lunch or buy your lunch at the cafe on site. There’s plenty of bushwalking tracks to keep you busy and there a shed with an informational video to tell you all about the history of the area. 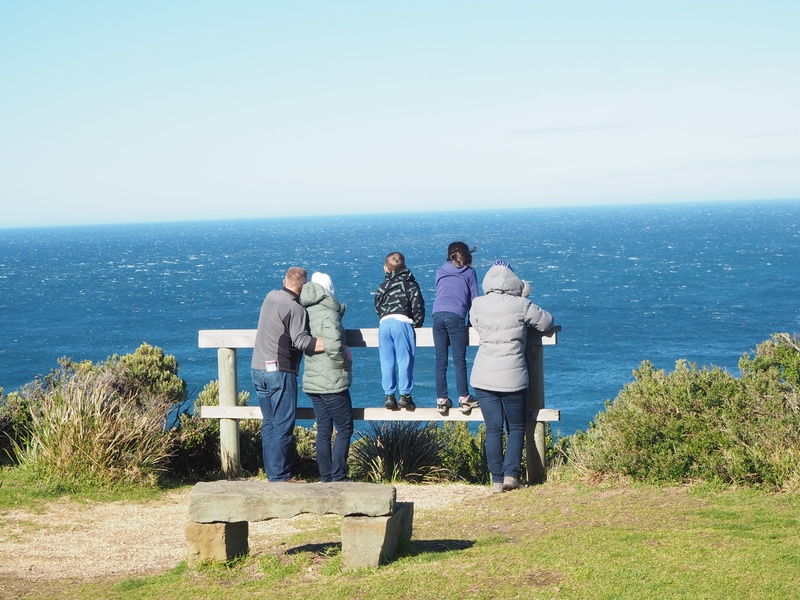 Taking in the Bass Strait views from one of the many lookouts! There were even dinosaur remains discovered here in 1991. There’s a sandpit for the kids to dig for fossils with a few different dinosaur bones hidden in there for good measure! There is plenty of room for the kids to run around and do cartwheels. Its also a great place to see some typical Aussie flora and fauna and of course the coastline is breath taking. If your lucky you might see a whale. Port Fairy is a little further down, just past the end of the Great Ocean Rd, we recently visited for an Instameet and found it to be a great little town and not as busy as many of the others on the Great Ocean Rd. If you are heading over the other side of the bay towards Gippsland, Phillip Island is another great place to visit with kids. we have been down there a few times and the kids always love it. If you’re down that way its certainly worth a visit, on the way out the kids got an ice cream and a small gift of a placemat for the dining table to remind us of our visit. I like practical gifts! I have read this put up and if I may I wish to counsel you some attention-grabbing things or advice. Hi Chrinstine, thanks for your comment, if I come across any further information I will update the post and let you know. I haven’t been down that way for a while. They did have some really nasty bushfires there last christmas, hopefully the koalas survived. Thanks for contacting us, I’m glad you are enjoying my blog. I see you are from Vietnam? Vietnam is one of our favourite cities, hoping to get back there one day soon.